A true adventure game takes you on a real adventure. If you want to experience a real adventure, an arcade action game that will both challenge you and addict you, here is one of the best games ever created for the iOS and Android platform. To The Castle is the game that kept us all entertained for the past week and we wanted to share it with you. This cross-platform game is created with retro gaming style, amazing HD pixel art and intuitive user interface. Not only the design, but the storyline and the gameplay as well are authentic and lovely. You play in the medieval era, with the brave knight called Sir Petronius. 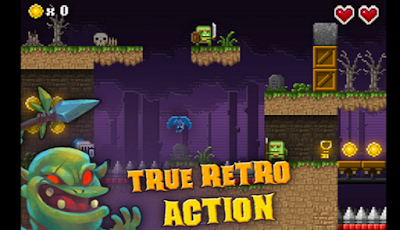 Your goal is to take him through the dangerous dungeons, full of enemies and obstacles and exit him from each level. To The Castle contains 60 levels, all with different difficulties and challenges. Simply tap on your display to make the knight dash and jump, collect the coins along the way and escape from the evil forces. They, for example the undead zombies, can attack you and make you lose the game. You can also create your own dungeons, moderate them with the level editor and share them with other players. All of you can enjoy one another’s challenging new dungeons and have fun like you never did before. Let Sir Petronius take you on his thrilling and fun adventure, download the game for free from the Windows App Store, the App Store or from Google Play today!